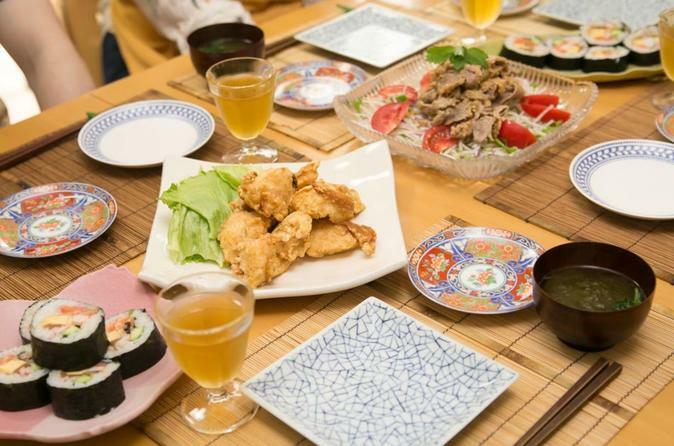 Do you love traditional Japanese food, but feel that it’s too difficult a cuisine to learn? Have you got the idea that you need special ingredients and years of study just to make something authentically delicious? Megumi Sato is waiting to teach you that cooking is easy and fun — with a few important tricks, you will learn how to prepare a gorgeous, full-course Japanese meal from all-natural ingredients in the comfort of your own home. Megumi’s menu changes seasonally (she also takes requests), so no matter what you make you will be using the most delicious seasonal ingredients! From beautiful pressed sushi and juicy chicken cutlets with Japanese-style tartar sauce (made from scratch), to rainbow-colored rice salad and scrumptious homemade dessert, there will be something for every palette. After the cooking is done, enjoy learning how to serve your yummy handmade food in exquisite handmade serving dishes, for a traditional meal experience. With the tricks you’ll learn, you will be able to cook these, and many more wonderful Japanese dishes at home, and also apply your new knowledge to your own dishes too, much to the delight of your family and friends. Food is one of the things that connects us all — let’s make it fun!